Exotic subatomic particle confirmed at Large Hadron Collider after earlier false sightings. Pentaquarks are made up of five quarks bound together. An exotic particle made up of five quarks has been discovered a decade after experiments seemed to rule out its existence. The short-lived ‘pentaquark’ was spotted by researchers analysing data on the decay of unstable particles in the LHCb experiment at the Large Hadron Collider (LHC) at CERN, Europe’s particle-physics laboratory near Geneva. 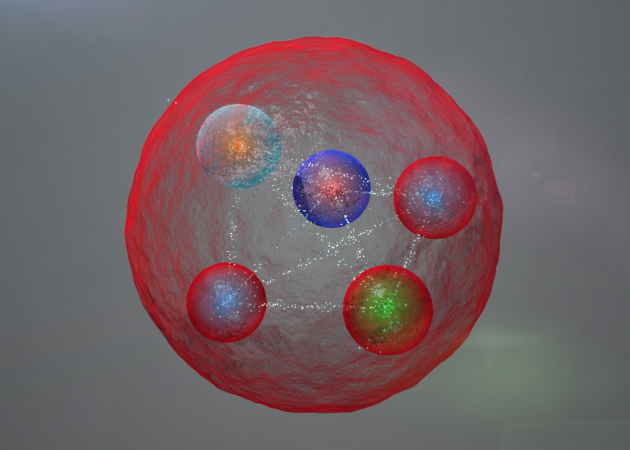 The finding, says LHCb spokesperson Guy Wilkinson, opens a new era in physicists’ understanding of the strong nuclear force that holds atomic nuclei together. “The pentaquark is not just any new particle — it represents a way to aggregate quarks, namely the fundamental constituents of ordinary protons and neutrons, in a pattern that has never been observed before,” he says. “Studying its properties may allow us to understand better how ordinary matter, the protons and neutrons from which we’re all made, is constituted.”…. This entry was posted in High Energy Physics and tagged CERN, pentaquark. Bookmark the permalink.